b) frequently rotate the hoop around parts of the body other than the waist, including the hips, chest, neck, shoulders, thighs, knees, arms, hands, thumbs, feet and toes. All spaces both within and outside of the hoop can be freely explored. Modern hooping has taken cues from diverse art forms such as rhythmic gymnastics, hip-hop, freestyle dance, fire dance, twirling, and other dance and movement forms. 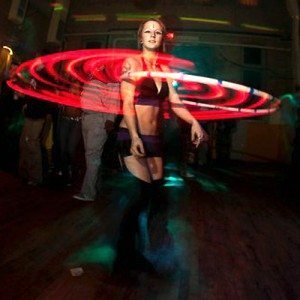 Hooping is part of the greater spectrum of flow arts, which are playful movement arts involving skill toys that are used to evoke the exploration of dynamic, flowing, and sequential movements. This movement, and the related mind/body state, is referred to as “flow”. Technically, hooping is a form of object manipulation and therefore shares some lineage with classical juggling. In its modern incarnation as an art form, dance form, and exercise modality, the practice is referred to either as “hoop dance” or simply “hooping”. Hoop dance artists commonly refer to themselves, and the greater hoop dance community, as hoopers. Hoopers generally use handmade hoops crafted from polyethylene (HDPE) or polypropylene (1″ or 3/4″ or 1/2″ diameter) piping and wrapped with colorful tape, which serves the dual purpose of providing decoration and grip. These modern hoops differ from the water-filled plastic toys commonly available for children. The heavier weight of these handmade hoops allows for more controlled movement around the body; the larger diameter and heavier rotational mass allows for both slower rotation, and ease of learning moves such as “portal” tricks, where the hooper steps through the hoop while it is still rotating. In contrast, children’s hoops are typically made of lightweight plastic, have a very small diameter, and are incredibly difficult for most adults to use. Circus hoopers such as Elena Lev (of Cirque du Soleil fame) typically use lightweight hoops made of aluminium, or, in earlier days, wood. Typically, an adult will begin with a hoop of approximately 38-44″ on the inside diameter. While these hoops may seem huge compared to children’s hoops, they are typically required for adults to have success and enjoy hoop dance. Many people eventually decrease the size of their hoops. Advanced hoopers typically use a hoop between 30″ and 36″ on the inside diameter, although that varies from hooper to hooper. A lighter hoop allows for faster revolutions and more advanced tricks, but also consequently take more skill on the part of the performer. Heavier, larger hoops are more often used for slow hooping and body tricks while lighter, thinner tubing is used for quick hand tricks. These hoops may be covered in a fabric or plastic tape to ease the amount of work in keeping a hoop twirling around the dancer, and can be very colourful. Some use glow-in-the dark, patterned, or sparkling tape, and others are produced with clear tubing and filled with plastic balls, glitter, or even water to produce visual or audio effects when used. Hoops can be made collapsible for easy transport and versatility: each hoop breaks down into four or more pieces to later be reassembled. Other collapsible hoops are simply twisted down, and folded in half for easy storage. LED hoops have internal batteries and are lit with LED lights, and make mesmerizing patterns when spun at night outdoors or in low light environments.